This beautiful four-bedroom luxury villa with pool offers both stylish accommodation and an great location. 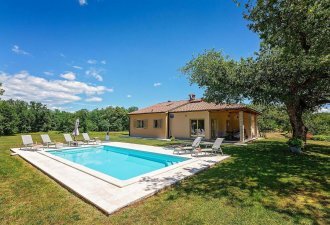 Best suited to a group of friends, or family this villa is the perfect base from which to explore everything that Istria has to offer. It is located in small and quiet village, yet near the sea and beaches. The interior has been finished to the highest standard, quality materials and designer furniture have been used throughout to complete the villa’s unique design. Each bedroom have its own en-suite bathroom and air condition. The elegant living space has an exit onto the outdoor terrace and stylish exterior where you’ll find the villa’s private swimming pool and sauna. It’s the perfect place to cool off after a day on the Istrian sun. Restaurants and shops are within easy reach too. Though with a satellite TV, Dvd, PS 3, foosball and table tennis there’s really no need to ever leave this beautifull property.